I don't know why I get nervous about a half marathon, but I do. I always complain about the early start time on these races and then I turn around and lay awake staring at my ceiling at 4:30. The one advantage when I do decide to just get up is that I don't feel rushed at all. Plenty o' time to meditate for a half-hour, and pretty a hearty breakfast of a peach, whole wheat toast with almond butter, and a bowl of chia mix, something new I'm experimenting with, a la the Tarahumara natives featured in Born To Run. Hard to tell if it's a good energy boost or not, but the combined mix gives me some energy and helps me ignore how little sleep I've gotten. I also decide to brew a hot green tea for the drive over, which is a risk, because I don't want to end up like in last year's Detroit Marathon, having to make emergency pee breaks. I'm hoping ingesting early, on the drive over, will give me time to flush everything out (sorry if that's 'tmi'). The drive over is both calming and energizing. The sky is just brightening, and all the low-lying watery areas have fog, but I'm random-laying through my iPod to all my favorite up-tempo groups. Nothing like a little Slayer in the morning. It's the sound of...victory. I'm early. Way early, which is a lot better than last year when I slept in and barely made the start. But that allows me to register at leisure, then sit in my truck for a half hour, with the heater on, watching the other vehicles trickle in. Actually, it's more like a flood after fifteen minutes or so. Perhaps I'm nervous because, in keeping with my marathon training, I actually ran four and a half hours last week (about 21-22 miles I figure) and haven't run much at all since, still recovering. In fact, if I weren't running this half-marathon, I'd probably be running a much longer run today or tomorrow. But what I like about my half-marathons is that I actually seem to run them pretty fast. Last year I ran this one somewhere under 1:50. So, a bit o' speed work today. Ideally, I would love to be able to run a marathon at my half-marathon pace, which would put me in around 3:30, but I seem to actually be getting slower. I know there's ways to bring my pace up, but that involves work, which makes me fear running not being fun. I just like to get out on a trail and listen to birds. Ah, denial, that mighty river in Egypt. Another reason I'm a little nervous is that I'm trying out new minimalist footgear: huarache sandals. Ordinarily I prefer to run barefoot, but since this race is about half gravel road, I'm covering up a little. I wore my VFFs last year, with great success, surprising myself with speed, but even then I have a memory of one section of gravel road in particular which was just brutal, which even a shod person said she was having trouble with. My huaraches have an even thinner sole than my VFFs, so I fear a return of that brutality. On the other hand, I'm a much more experienced barefoot/minimalist runner, having practiced at the Arboretum in Ann Arbor, which has some rough paths. My huaraches were made by BareFoot Ted, one of the barefoot runner masters, featured in Born To Run. While down in Mexico to compete in an ultra-marathon with the super runner Tarahumara, Ted learned how to make their hauraches, and now makes them from his home, under the name Luna Sandals. The design is fairly basic, just a rubber slab cut to the shape of the runner's feet, with one long thick leather strap coming up between the big toe and 'pointer' toe and criss-crossing over the foot and through two more hole on each side. If I had the gumption and the technology, I could probably make my own, or some form of them, though I have neither, and I wanted to buy a pair from Ted, the expert, to see how it's properly done. He also sells kits, with the basic materials, for about half the price, and I suppose one could just do like the Tarahumaru and cut out a chunk from an old tire. But what I like about Ted's huaraches is how thin the rubber actually is. Any more thinner and I'd be back to barefoot (except for Paper Feet! which I've also reviewed). Meaning, I can feel most bigger stones and sticks, so I still have to pay plenty of attention to where I step. But the rubber cuts down on the nitty gritty gravel, painful after a while on a gravel road, and would eliminate the risk of glass, though I don't usually have a problem with that. Like I said, I prefer running barefoot, and like feeling what's under me, so I've mostly just worn my huaraches walking around town. I do like the look, with the leather strap coming up and wrapping a few times around my ankle. Très gladiator! I also prefer, unlike the VFFs, that my feets are uncovered, and free. The more I can keep my feet in the free air, the happier they are! Obviously, he's got some background. I explain how I usually run barefoot, and then we start talking about VFFs. He's got some, but doesn't want to throw off his training schedule, so is still running in shoes this summer. I warn him that I've heard of a couple people who tried to mix and match VFFs and shoes and who ended up hurting themselves, and urge him to just take the plunge, but as I talk to him, I realize he's a competetive runner. When he starts telling me his marathon times (he qualified for Boston for example) I'm impressed. Even more impressive: he's sixty-two! In fact, he won last year's Somerset Stampede for his age category. Now I feel a little silly lecturing him on running. We trade marathon war stories (we've both run Detroit and Chicago) and I wish him the best, since I probably won't see him during the race. Everyone gathers for the start. I'm about midway, not entirely in back. I'm still experimenting with either starting in back and then being able to pass a lot of people, for good psychological benefit, or just starting out fast and pushing as long as I can before penguin waddling the rest, though for a half-marathon I'm anticipating going fast again. That is, if my feet can take a fast pace. The problem with minimalist footwear, huaraches or VFFs, is that I tend to footstrike a little harder than with bare feet. Or, that's how it feels. Something to do with losing sensitivity, and/or having something covering my feet, even partially, may shift my body back into shod-running mode. Add speed in, and I'll be hitting even a little harder. But again, I'm a little wiser on my cadence, and lifting the foot rather than concentrating on coming down with it, all described much better in Jason Robillard's Barefoot Running Handbook. This race is real low-tech. No bells and whistles, just a person with a start gun. I am pleased that this year there doesn't seem to be a pre-race prayer, which freaked me out last year, but that may be due to the fact that there are no bullhorns even, so us folks in back can't hear anything. One minute everyone is talking, and the next, BANG, off goes the gun, surprising us all. I've brought a watch along, since the low-tech aspect also means that there are no chips. The Stampede website claims that the race is “professionally timed” but what that really means is two guys with a stopwatch sit at a table at the finish line and hand write numbers and times. I don't care about winning today, I just want an accurate account of what I'm capable of. We're off. I'm immediately passing people, even at a slower, warm-up, pace. There's also a 5K, which will split off soon, so we have a mix of beginners and advanced runners. All ages, though I'm pretty sure we're all a bunch of white folks. Lot's of teen girls with cross-country t-shirts, must be some high school teams participating. Most impressive are some people a little on the chunky side. No crime in that, I just like that they're out here, probably as part of a get-in-shape goal. I wish more people would. Also cool: A whole family is running, mother, father, and two sons, who can't be more than eight and ten. All told, there's about....a hundred people? Maybe not even that. I'm terrible at judging things like that. Soon though, the 5Kers split off the right and the crowd thins significantly. Would be interesting to know how many are actually doing the half, but we're all spread out now. I up my pace, passing people. We get out on a paved road heading south. The road is technically blocked off by a police car, though after a while a car passes us in the left hand lane. The air warmer, I'm warmer, comfortable in a wicking t-shirt and shorts. The fog gone, the sun out. I feel alert and amped. Lots o' forest interspersed with cornfields, and older ranch-style houses, siting on two or three acres. Quiet out here, except for some dogs freaking out with all these intruders running by. I go into my spiel about barefoot running, and how I couldn't run for a year and a half from the dreaded plantar fasciitis, and it turns out he's had it too. Also interestingly, he's a marine, reserve, and has been to Iraq twice. I don't want to get too nosey, but we talk about that, and a book I recently read, by Jon Krakauer, called Where Men Win Glory, about Pat Tillman, an army ranger killed by friendly fire. This guy, Dan I think his name is, confirms one alarming statistic in the book, that during combat operations, up to one in four casualties is from friendly fire. Anyways, the point is, it's kind of nice to talk to someone for once. It doesn't seem forced, and both of us tell the other that to not let us drag the other down, but really, we're running at about that exact same pace. That is, we're helping each other keep a fairly good clip going. At this point I might have started looking at the birds or something, and slowed down a bit. But the miles pass fairly quick, and we're both slowly passing more people, though also getting passed a couple of times. Can I keep this pace up? Not sure, but I feel ok. I've got the 'lifting the feet' cadence going, with a slight lean of the body, sort of 'falling forward', and I feel good on the hills. I'm relaxing, trying not to tense up, and when I relax, my feet seem to 'strike' (not the real word I'd use for barefoot/minimalist running) lighter, and move quicker. The funny thing is, running with Dan, who is shod, his stride is longer and slower. I sometimes have pick up my shorter strides to keep up, which causes him, unconsciously or perhaps not, to run faster, etcetera. A good way to keep the pace up, if unplanned! We get to the gravel road section, and it's not quite as bad as I remember it from last year. I suspect that the road had just been graded then, and so was particularly gravely, but maybe I'm just mis-rembering. I tend to do that a lot. I wonder if the roads have been thinned out a little over winter? I actually feel like I could run this barefoot. I would go slower, of course, but as is, I'm still kind of hopping from side to side to get in the less stone-ier sections, whereas Dan and other shod folk can just go full speed ahead. Maybe I could do this whole thing barefoot next year, but honestly, I'm liking being able to go at this pace. Another thing I could probably work at, of course, since I'm sure someone like Barefoot KenBob (the guru of barefoot running) could zip right over this terrain. But mentally, I know I can do a half -marathon no problem, so no need to conserve energy. I've actually thought that a half-marathon is maybe the ideal distance for an amateur runner. Two hours seems a reasonable amount of time to run without total exhaustion. A marathon wipes me out for the rest of the day, mentally and physically. A half-marathon seems like a reasonable distance to train for, without taking too much time away from other things, and the length is enough where a runner needs endurance, but short enough that speed can still be a factor. But, I say that as a marathon runner. Someone who has only run a 5K might say a half would exhaust her. And those damn Kenyans would have finished a marathon by now. Actually not. Based on our watches and the mile markers, we're going at a decent clip. In fact, we end up passing the guy I talked to before the race. I thought he would be way ahead of me, but this is the pace he planned on, so I'm feeling pretty good. Surprising. Maybe I should just run half-marathons. Better for my ego. The pace we're keeping puts me just almost to the edge of feeling winded, and on hills I'm losing breath and can't talk, but I don't stop, they're still doable. Finally we've looped back around north, and come to the cut off to a trail that will be the last mile and a half. I remember it from last year, nice and soft and sandy, which is good for me, though I heard some shod folks complaining that the sand slowed them down. After that gravel, this feel like butter. The trails wide at first, an old two-track, but when it narrows, I take the lead in front of Dan and another guy who's been with us for a while, which feels weird. I thought I'd let them go first since, honestly, I'm having doubts about keeping this pace all the way. I'm feeling it in my thighs. But being in front of the pack, my male pride (or maybe it's just normal human pride) kicks in and I force myself to pick up the pace. Again, not longer strides, but lifting my feet faster. Dan gives me a “Finish strong!” and when a marine tells you that, you have to oblige. We pass a couple more people, but everyone if friendly and encouraging. One younger guy ahead of me looks back and sees me coming, and as the trees open up into open campground, he speeds up and actually cuts in front of me, old track running trick. Ok, fair enough, I don't mind, kind of funny, but the joke is on both of us, since we thought we were almost to the end. But no, up another hill and through some trees, and I catch him. I can hear people cheering up there somewhere, and man, that really helps, really motivates somehow. Pride I guess, wanting to look strong at the end. I give a little push, trying not to break out into a long stride, which would be very bad for my poor feet, but to pick up the pace, but we're on a dirt two-track again, basically soft dirt, so I start to open up. I may regret it later, with sore arches, but for now, gotta do it. Dan's right there. We're side by side, and people start cheering, which feels nice. We finish, and I'm only maybe a millimeter in front. My blood is pumping so hard I can't hardly even hear the official, who tears off a section of our bibs and hands us water. We shake hands and yes, even hug, then walk under some shade and watch other folks come in. Time: 1:45. A little under what I did last year. A new PR. And I couldn't have done it without Dan pacing me the whole way, though he claims I was pacing him. I have to say, again, that normally I'm a fairly loner type runner, but with the right person, 'running social' really contributed to my 'good time,' in both senses of that phrase. This may seem obvious to some people, but it's kind of new to me. We say goodbye, we may see each other up in Pinkney next month for the Woodstock running festivities, and head to my truck. Another thing about running with other people, I didn't feel like I was 'different' because of wearing huaraches. Usually I sort of feel like a freak, even if people are just genuinely curious about barefoot/minimalist running, but this race I just felt like a runner, period. Who knows, maybe at barefoot/minimalist running gets more common, this will be more commonplace. As for my feet, they do feel pretty hammered. The arches a little sore. I'm not quite marathon exhausted, but I'm weary, though that could be my lack o' sleep catching up with me more than anything. I go home, ice my feet, eat a peach and some almonds, shower, then basically collapse into a long nap. When I get up, me feet are even more sore. Like, hard to walk sore. So, I do think my feet hit a little harder in minimalist footwear. I don't remember feeling this sore from Dexter/Ann Arbor Half Marathon a few months ago and I also didn't run as fast either. The main soreness is right at the top of the arch, just on the inside of each foot. I'll take it easy for a few days, no running, and I'm sure it'll be ok, but another potential goal would be to run a race like this, in huaraches, and feel no soreness at the end. 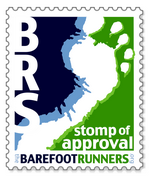 I would love feedback from other barefoot runners on this, to see if they have gone through similar aches and pains.